Here's a screen grab from the latest epidode of "Digging for Britain" ... featuring a [presumably] Diamond saw, on a transparent disc. Does anyone recognise it, please ? Could it be an optical illusion due to holes in the disk? 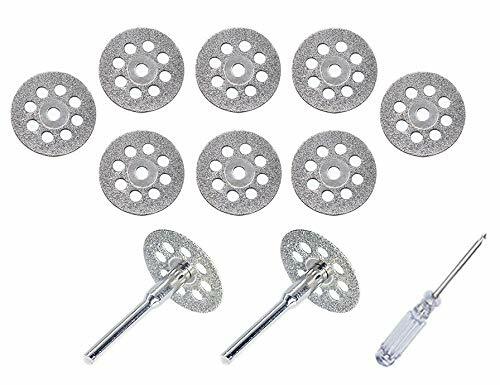 Something like these dremel diamond cutters on amazon. Could it be one with holes but due to the speed it appears as though it is a clear material. If it was plastic any heat build up may effect the clear plastic and distort the disc. Thanks, gentlemen ... I did wonder that. I have already written to Dr Madgwick, and will report back if/when he advises me. On eBay, from China, but for £3 I will take a chance. Or try a lapidary shop, they use fine diamond discs to cut stones, rocks etc. They also cut composites which is why I got mine!! I think Jason is probably right, my brother in law was a dental technician at the local hospital. He once showed me around his workshop and I can remember seeing a small holder with a range of very thin small cutting discs, not the type you would normally see for sale. Some of their's are slotted, rather than being perforated with big round holes ... so the optical illusion would probably be more convincing. I haven't watched the programme yet Michael but are you sure its a tooth and not a bone that he is sectioning? It doesn't look to have the right structure and shape for a tooth. It's not actually transparent - it has spokes, but you can't see them. It's a flexible diamond wheel that dentists use. I get them from prestige dental and they're about £12 each I think. So are you taking up DIY dentistry as a hobby for the new year?